Most states have a legal definition of what constitutes a handicapped parking space, where they must be located, and what size the spaces must be. This allows states to maintains compliance with the Americans with Disabilities Act, which is a federal government act that serves as the law of the land with regards to providing equal access to public spaces for disabled individuals. Maryland, like the other states, has handicapped parking requirements in place. Maryland's handicapped parking laws are slightly different from some other states. Unlike many other states, Maryland does not have a state-mandated standard-sized handicapped parking space. This means that in Maryland, either the ADA recommendation establishes the minimum size or each specific country has their own rule that mandates a larger size than the minimum the ADA requires. If you visit Maryland, be prepared to see a wide array of possible sized handicapped spots depending on county. There are also spaces in Maryland which are designated as residential handicapped parking spaces. These spaces are approved for use by individuals who have no suitable handicapped space available near their home. Parking in these spaces is only allowed by special permit. These are designated areas on public streets which are marked with poles and special signs indicating their status as residential handicapped parking spaces. They are only intended for people with permanent, doctor-certified disabilities. In Maryland, illegal use of a handicapped parking pass can get you a fine of up to $350, as of June 2010. This fine applies both if you obtain a parking pass through fraudulent means or if you use someone else's handicapped parking pass when that person is not in the vehicle with you. If you are seen by a MVA or police officer, you can be fined on the spot. You could also be reported by an average person who notices someone without a visible handicap leaving the vehicle in the handicapped spot. Writing, Alexis. "Maryland Handicap Parking Requirements." 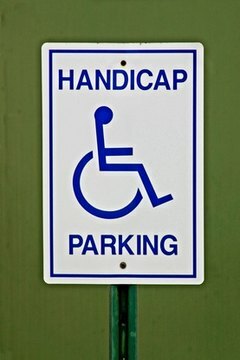 , https://legalbeagle.com/7240769-maryland-handicap-parking-requirements.html. Accessed 19 April 2019. What Are Red Handicap Parking Placards For?